On 14 November 2016, a US delegation from US representatives from university and public environment such as NASA and US Department of Energy of the George C. Marshall Foundation, visited Austria. The group of 12 people landed in Vienna on Sunday, where they were welcomed by the Austrian Economic Chamber. The next days, the delegation visited leading research facilities and research companies in Vienna, Graz, Leoben and Linz. 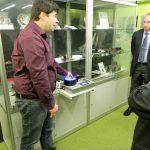 On 17 November the delegation visited the Linz Center of Mechatronics GmbH. In a 1.5-hour visit at the Science Park, LCM was able to present its knowledge and areas through presentations and demonstrations.